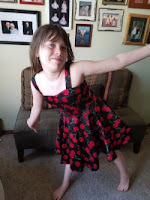 This past weekend, my eldest, Avery, was going to her best friend’s birthday party. They have been besties since kindergarten and Avery was excited for the big day. She then told me something I didn’t see coming. She told me that she wanted to buy the gift for her friend herself. Maybe it wouldn’t be a big deal in a lot of families, but my ten year old telling me that she wanted to buy her best friends birthday gift with her own money was a big deal in mine. Over the weekend she wound up buying birthday gifts for her youngest sister's birthday and for her best friend. She used her own dollars as well as a gift card she received over a year ago. Avery has never been a spender, at least of her own money. She has literally watched gift cards fade to zero worth because of her inability to part with them and I am quite sure her savings account is more robust than she can imagine. The fact that she doesn't ever buy herself anything makes it as surprising as anything else that she chose to use her money on her friend and her sister. It was surprising, but not unheard of. It reminded me of a story from years ago. It was a proud moment for yours truly. It was Easter and Avery was three or four years old. We were at church and there was an Easter egg hunt directly after the service. The age groups were broken up and Avery wound up being among the older of the kids in her group hunting down their quarry. A whistle sounded and Avery and the other children began filling their baskets. At their age calling the eggs hidden would be a stretch. Kids that were Avery’s age swooped in and within moments had full baskets. Behind them was an army of empty basketed toddlers looking helplessly around the playground. Then the remarkable happened. Avery began hiding her eggs and guiding the toddlers around the yard. The little ones beamed as they finally found the plastic orbs. When all was said and done, Avery’s basket was empty; her father’s heart was not. On the way to the car I asked her about it and she explained that she had plenty at home. That the little ones didn’t have a chance against the older kids and that some of them may not have candy at home. I remember a stunned silence between my wife and me. The silence was broken by my phone. It was my brother calling to wish a Happy Easter and to describe his own proud papa moment. 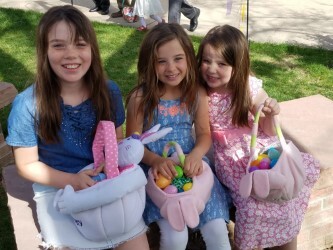 NOTE: My niece and nephew are wonderful children and their actions on that particular Easter are not a reflection of the young people they have grown to be. Clearly their actions are the fault of their father and absolutely no one else. Anyway, my phone rang and my brother was on the other end. We exchanged “Hoppy Easters” and told each other about our proud papa experiences. I started by telling Steve about Avery and her emptying her basket for other children. I told him about how happy she was doing it, without a hesitation during or regret later. I told him how proud I was of her. The other end of the line went silent. He took a moment and said, “I was much prouder of my kids before this phone call”. He said that he had brought his kids to an Easter egg hunt. They had traditional plastic type eggs filled with candy but they were also giving away a few full Easter baskets. Ryan and Olivia are athletic kids and apparently the prospect of getting a full basket of candy appealed to them much more than small plastic eggs. The way my brother described their effort was akin to the way someone would describe the doors of Wal-Mart opening on Black Friday. He described the rugged elbowy running style of his kids. He then let me know that his children had claimed two of the three Easter baskets. “I was really proud of them before I hear Avery’s story.” He said. From the tone of his voice, I could assume his kids did not give their baskets to smaller, less elbowy children. My brother and I have made plenty of jokes about how our kids stack up to each other’s kids, this was one in the ‘W’ column for me. Couple of lessons here girls. The first is a little something about perspective. Uncle Steve was at the pinnacle of proud until he heard about Avery’s generosity. The fact is that the Easters we had were mutually exclusive. Steve had every right to be proud of his kids for mauling the other kids for chocolate, while I had every reason to be proud of Avery. Just because Avery committed her act of generosity did not diminish Ryan and Olivia’s athletic achievement, but don’t tell Steve that. The second lesson is one you’ve heard a thousand times before, but it bears repeating. There is nothing worse than a bully. Picking someone out because they are smaller, weaker or different is one of the few things you could do that would make me question any one of you. At the same time, there is nothing better than someone who sticks up for the little guy. Avery, the generosity you showed those other kids was beautiful. I will admit to being biased towards all of you girls, but every once in a while, and that day being one, you girls are the talk of more dinner tables than just our own. Final thought: For those who read the last post (and to those who didn't) Mai, Nash and their family can still use a hand. Please click this link and loosen your purse strings. Believe me, it’ll feel great knowing that you’ve lent a hand to a family that both needs it and deserves it. If you happen to be a business owner who wants to give a little more, reach out to me. We will brand our Wild West Relay shirts, our van and a finish line banner with your logo (hopefully you will be among a bunch of logos!). If you don’t have the means to help, you definitely have the means to share. Please either share this post, or the donation link wherever you can. It’ll be a huge help, trust me!